These are few sea shells, the designs of which I have picked up from one of Tomoko Fuse’s book – Spirals, Shells, Boxes, Snails – which has been published in the Japanese language (that I know of). The ‘Nautilus’ shell and the common sea shells look really pretty when completed. Most of these use the technique of ‘pleating’ to form spirals (such as the Nautilus) or the technique used in Tomoko Fuse’s ‘Espiral’ Model. 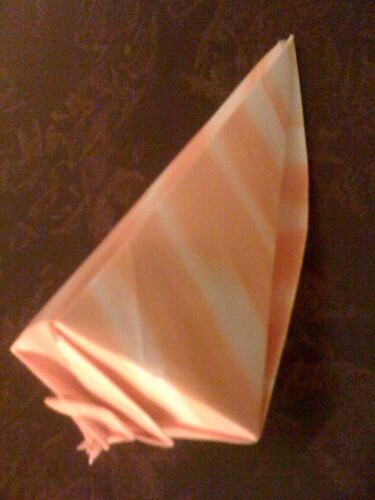 You can fold these pretty shells from wrapping paper or from common origami paper which you might have. I have used square sheets of foil paper which I bought from Michaels, not long ago. This gives the shells a nice gleam 🙂 I also used single side colored common origami paper for some of the shells and these came out quite nicely, too. The size of the paper (in both cases – foil and common origami paper) are at 15 cms or 6 inches. I find that this particular size is really convenient to fold most models which are not too intricate by nature. Barbabellaatje has posted a good instructional video on the making of these shells. I am sure you will find it easy to follow, too. You can also find the diagrams to these models in Tomoko Fuse’s book – Spirals, Shells, Boxes, Snails .